Today, I received a very moving and unusual visit on Parliament Hill, where I protest with my graphic signs against abortion. Alex, a middle-aged man who is very pro-life approached me and began conversation with a very serious demeanour. He shared many things with me. The most striking and heart wrenching was the true story of a documentary that he had watched. It was about a Russian woman named ‘Ludmila’ who had aborted her baby. As Alex shared his emotions and tears reached out to me. I listened very carefully. She was in shock as she observed this genocide of so many unborn aborted babies. Her shock increased as she observed various human ‘pieces’ beginning to ‘come together’ and form ‘one’ baby. As the baby came within feet of her, the Ludmila realized she could not receive her child or help her because there was a ‘huge and solid but transparent wall’ between her and the baby. As a mother, she experienced sheer agony as she saw demonic spirits of abortion tearing away at her baby! The baby was screaming in pain! This scene was repeated several times in front of the totally helpless mother. Suddenly, Ludmila came back to life, never to be the same again! She frantically sought help. She met someone who offered to help her by doing a documentary of her experience and this way she is helping many women to be warned of the horrific truth of abortion which is the murder of the innocent unborn babies”. Can you imagine yourself being ‘in’ the horrific experience of this Russian mother? You are unable to help your baby who is being destroyed by abortion by the evil abortionists, the tools of the demonic spirits of abortion. This inability to prevent the demonic spirits from tearing away at her baby must clearly show the ‘trauma’ that her baby went through while it was being aborted. Upon seeing this the mother experiences her own trauma, which is the guilt of having murdered her own flesh and blood, her innocent, helpless baby. NOTE: Karen’s story is found in an excellent book: “Sharing the Heart of Christ, by Kevin Burke, LSW, Theresa Burke, Ph.D., Fr. Frank Pavone.” Please take advantage of these resources to better understand God’s awesome mercy. Warning: The video is not an easy film to watch, however it is so powerful, so meaningful, and exhibits the great love and mercy of God for all who turn to Him. I would like to comment on the ‘transparent wall’ which prevented the Ludmila from helping her baby which was being attacked by the demonic spirits of abortion. 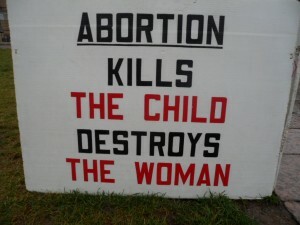 This transparent wall represents, in my opinion, the ‘Culture of Death’ here in Canada and throughout the world today. This ‘sinfilled wall of death’ represents organisations like ‘Planned Parenthood’ who profit by the millions of dollars through the business of abortion. This wall of death also represents all the agents of the Culture of Death such as the abortionists and their associates, the boyfriend and family members who exert pressure on the pregnant women to abort their baby. This wall of death represents the extremely selfish and unrepentant pregnant woman who heartlessly says: “My body, my choice” and willingly and knowingly murders her baby because it is an ‘inconvenience’ in her life. This wall of death also represents all those Canadians who voted for the pro-choice politicians who voted to get rid of the abortion laws. It also represents our Prime Minister, Stephen Harper who refuses to allow M.Ps and Canadians to discuss abortion. It also represents all those pro-choice M.Ps who voted against Motion 312 (www.stephenwoodworth.ca) which if passed would have proven the humanity of the unborn child. I now extend my reflection to the ‘mountain sized’ pile of aborted babies that Ludmila saw. Alex spoke of the mother seeing a ‘mountain-sized pile’ of aborted babies. Ask yourself please, if all the aborted babies from all over the world were put in one pile, we would have no less than a ‘Mount Everest’ sized mountain of innocent, helpless, dismembered, murdered, bloody aborted babies. Think of the effect this would have on the world if they were to see such a gruesome sight, just as Ludmila saw after her death. The effect would certainly be life-changing, similar to seeing the millions of bony and starved cadavers, stacked up one upon another, waiting to be buried or cremated of all the naked Jewish people during the war in the last century. This is the reason that myself and Fr. Tony Van Hee, S.J., (and many other pro-life Canadians,(cf: www.unmaskingchoice.ca ) are on Parliament Hill with our graphic signs to show each visitor, young and old, the ‘TRUTH’ about the barbarism of so many pro-choice Canadians, such as our Prime Minister and the pro-choice Members of Parliament who refuse to protect the unborn babies against the slaughter of these innocent, helpless unborn babies in the womb of a woman. This womb is the most dangerous place to live today. So that those who are ‘pro-choice’, will realize the magnitude of this ‘choice to kill’, just as the Russian mother, Ludmila, did, when she helplessly came ‘face to face’ with her unborn aborted baby and later met up with the love and mercy of God. Pro-life advocate, Ottawa, Ontario, Canada.